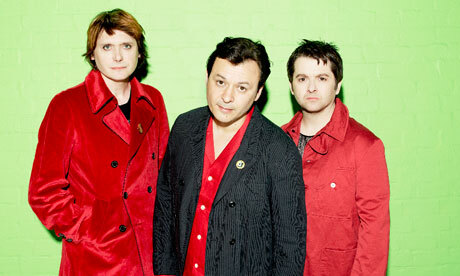 The Manic Street Preachers will feature in this week's NME, listing their official UK singles i.e. the ones that feature on their forthcoming, almost-comprehensive (no 'Suicide Alley, 'New Art Riot' or AA-sides) hits collection 'National Treasures', in order of preference. Meanwhile, their Christmas gig at the 02 in London, will feature every single one of these, as they grimace through some their own bêtes noires, such as 'Love's Sweet Exile', 'Revol' and 'The Love Of Richard Nixon', which any sane person would rather hear on a daily basis than the likes of 'Autumnsong' or 'You Stole The Sun From My Heart' even just once more over a 12-month period. To mark the occasion, I decided to compose my own chart, but rather than simply write a list off the top of my head, I marked each single on five different factors: How it sounded upon its first airing, how it sounds now, MSP trademark drama/poignancy (which can be a by-product of context, history and significance. Over-production and strings alone are not enough, not enough, not enough, however), lyrics (sorry, Nicky) and edginess (for they were initially very raw and uncompromising for a chart act, and have even been fleetingly audacious since Richey - the endearingly bizarre 'Nixon' being a very daring comeback single, from one of the few genuinely forward-looking latter-day campaigns). I then summed up the average marks for each of the records, sorted them appropriately and discovered a rather interesting list. I tried a graph too but it wasn't working for me, unsurprisingly it consisted of a huge post-1996 plummet with a few resurgences. Unfortunately the reverse order thing doesn't look very good written down, so this chart goes from 1-38, with additional notes. REVOL 1994 9.2 'Insane that this intensely uncommercial release hit #22'. So, not surprising to conclude that the howlers occur when they go big, bombastic and court a mainstream audience that doesn't exist currently. The ego-puncturing nature of the broken Top 40 hits run can only invigorate them if they continue, and the prospect of '70 Songs Of Fear And Hatred' may even pick up where 'Journal For Plague Lovers' left off. Whilst the majority of the songs that make up the bottom reaches aren't necessarily awful songs by any stretch of the imagination, I'm finding the appeal of these tracks to be more and more short-lived. The reason 'Everything Must Go' was so successful was, not only because of the musical climate, but because of the context, and whilst that album was a sophisticated and dignified affair, subsequent attempts to emulate its sound have seemed contrived and bland. The all-too-fleeting introspective electronics of 'Lifeblood' have aged well, and it would be pleasing to see the band head down another previously uncharted (for them) avenue again, and whilst admittedly it was built upon Richey's leftover lyrics, 'Journal For Plague Lovers' was a stunning turnaround in quality, which managed to balance the troubled post-punk nihilism of the Richey years, with the majestic accessible pop they have often pulled off since then. So, I'm hoping this collection draws a line under the commercial-success chasing years, with the band having bled bombast to death, especially if their hits of around 20 years ago are sounding more wisely developed than that of the last five years. They still have in it in them to make great music, and be culturally and socially relevant, but having attempted to emulate the sound of 1996 on at least two occasions now, maybe its time to focus on introspection rather than bombast, small instead of big, forward-looking rather than perpetually nostalgic, prioritise edge over polish and cult appeal versus mass communication. In other words, catering for their original fanbase (if not literally, certainly that type of fan), despite what those '26 million album' claims would have you believe. The problem with the masses is that they're not really into culture, alienation, boredom or despair. *minus the Heavenly recording of 'You Love Us', a great snapshot of the shambolic pre-Sony days, but not too relevant here, plus that's the kind of song that always needed the ridiculously shiny glam-metal production it got in the end.